Last month’s site showed that interesting sites need not be remote and inaccessible. This month we feature one which is similarly easy to visit. How many of us have sailed up the A9 towards Golspie, little realising that a gem of industrial archaeology is easily accessible – with carpark – at The Mound? A bridge, with sluice gates was constructed by Thomas Telford in 1816 to carry the Parliamentary Road northwards. Originally four, and then expanded to six in 1837 by Joseph Mitchell, the gates were fitted with non-returnable flap valves which allowed the freshwater from Loch Fleet to drain into the sea, but prevented salt water from coming into the Loch. The well preserved system of chains and pulleys which operated the sluice gates is still visible. Thomas Telford arguably changed the face of the Highlands in the years he worked in the area. 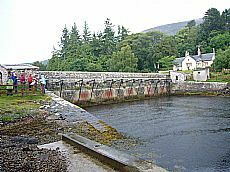 He was responsible in the Highands for over 100 bridges (cast iron and stone), almost 1000 miles of new roads, canals (from the famous Caledonian canal to the little remembered Dingwall canal), parliamentary churches and associated manses (e.g. at Croick), harbours and piers, and even a town (Pultneytown in Wick). Many, as the Mound, involved complex engineering. The Mound was also a station on the Inverness to Wick line, built in 1877 and now a house. It also served as the terminus of the Dornoch Light Railway which operated from 1902 to 1960. Piers survive of the viaduct which carried the line from to the station towards Dornoch, and remnants of the line can still be seen along the coast towards Skelbo. If you are interested in finding out more about the heritage of this area, ARCH is offering a course Exploring Your Local Heritage beginning 11th March 2010. Further details in the Events section of the website.